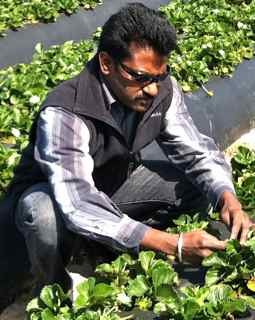 According to Surendra Dara, Strawberry and Vegetable Crops Advisor and Affiliated IPM Advisor, UC Cooperative Extension, Santa Barbara and San Luis Obispo Counties Greenhouse whitefly (Trialeurodes vaporariorum) is the predominant species of whiteflies on strawberries in the Central Coast. In addition to strawberries, greenhouse whiteflies have a wide host range that includes important commodities such as avocados, caneberries, grapes, lettuces, peppers, tomatoes, and ornamentals grown in the Central Coast. All these crops serve as a source of infestation to each other and increased the threat of whiteflies not only to agricultural fields, but also to nurseries, and home gardens in the recent years. Agricultural Commissioners’ offices in both Santa Barbara and San Luis Obispo Counties and UCCE office received calls this year from strawberry growers, nursery producers, and the ornamental industry to address the whitefly issue. In response to this issue, UCCE unit serving these two counties increased the outreach about whiteflies, their feeding damage, and disease vectoring potential through extension meetings and publications. Some fields in the Santa Maria and other areas which suffered from heavy whitefly infestations early in the production season later developed symptoms of pallidosis-related decline. Diagnostic tests conducted by CDFA and USDA laboratories in Salinas and Corvallis (Oregon) identified multiple viruses that cause the decline. Extent of infection varied from mild disease symptoms in some fields to total dieback. Corresponding damage also varied registering up to 65% yield reduction in some fields.